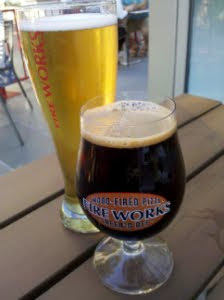 Fireworks Pizza just opened last week down the street in Courthouse to much fanfare and anticipation. The large restaurant on Clarendon Blvd and N. Adams St. offers an air eating area, bar with TV, and a surprising amount of outdoor seating. There is also an interesting looking outdoor fireplace that is available to eat around, but they have not lit it yet. I highly recommend dining outside if the weather permits. Their staples are obvious, with good beer and pizza selections, although the spinach dip appetizer was delicious. Their beer choices were my favorite part, and they came in nice branded glasses as well. The pizza was good but honestly can't compete with Pupatella on Wilson. I'm very happy that Fireworks opened in this section of town, as it will help out the nightlife in this border region between Clarendon and Courthouse. There was plenty of foot traffic around Clarendon Blvd during the day, which also makes it a great people watching venue. The Clarendon Alliance is hosting the annual Clarendon Day parade and local festival on Saturday September 25. This is a fun and family friendly event, with lots of local businesses and restaurants participating like Whitlow's, Liberty Tavern, Rocklands BBQ, Mister Day's and others. Looking forward to it! Clarendon is often known as a drinking hole and nightlife venue, but its also home to many gyms and cross-fitness arenas. It seems that Arlington likes to work out as hard as they party. Thanks to What's The Deal DC for hosting the Clarendon Fitness Collective prize raffle this week. The gym located on Highland Street next to Mister Day's is giving away a couple prizes including $500 worth of Personal Training services. The drawing ends Friday August 27 at 4pm, and all you have to do is enter here and be their friend on Facebook. Of course the Cheesecake Factory is known for its extensive desert selection, but one new entry stands out once you see it. 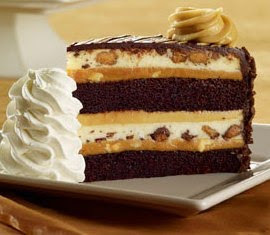 The Reeses Peanut Butter Chocolate Cake Cheesecake is so rich and delicious, it actually hurts a little bit to eat it. It's big enough to share, and I doubt anyone consuming one alone could survive. The restaurant was nice enough to do something to take a little of the guilt away from eating this insanely good desert. They claim that for each one of these cheesecakes sold, 25 cents will go to "feed hungry Americans in our communities." I didn't get any details about exactly which local charities would benefit (the Arlington Food Assistance Center comes to mind) because I was distracted with its million calorie goodness. The Washington Post's Going Out Guide recently did a feature of places in Clarendon that makes them happy. Not surprisingly, Lyon Hall was ranked #1 as it seems to be the hip place to be seen now. But I agree with Clarendon Culture that Eleventh should be somewhere on this list. The tiny little lounge serves a nice alternative to the huge and loud scene at the Ballroom. But maybe the less people know about our local hidden gems, the better for us. One local gem that did make the list was Iota, my favorite venue for live indie music and open mic nights on Wednesdays. I'm sure we will have lots more places to make us happy in the neighborhood once the Clarendon Center construction finishes late this year. Thanks to Cecelia for the link! Check out her book blog... if you're into that kind of thing. Last week I was lucky enough to be in the city for Shakespeare Theatre Company's rendition of the comedy Twelfth Night. This is a free show hosted by Lansburgh Theatre the running August 19 to September 5, 2010. Since the DC tax payers paid a cool $20 million to build the theatre, several free shows have been put on to give back to the community. The best way to get tickets for these shows is to sign up for the online lottery they day of the event. If not, you will have to wait outside in line for the Will Call tickets remaining. It looked like everyone waiting in line was able to get a seat though. The theatre is very modern and refreshing, and I honestly don't think there is a bad seat in the house. This incarnation of Twelfth Night was very entertaining and fun, with plenty of adult PG-13ish humor to make the Bard proud. I highly recommend this as a different, upscale and free date venue for the city. Try to take the metro to Gallery Place because parking is limited. Or if you don't feel like straying from the Orange line exit at Metro Center, it is only a five block walk east to the theatre. Today was a beautiful day for the Arlington County Fair, hosted at the corner near Route 50 and Glebe road south of Clarendon. I was one of the lucky winners of the fair's twitter contest, scoring a shirt and tickets for three rides for free. There are basically two parts to the fair: the indoor array of vendors/shops and the outdoor rides, food and carnival games. I was impressed with how many different rides were available, from the traditional Ferris wheel to the Super Shot vertical drop. I got my fill of cotton candy, chocolate shakes and "winning" tiny stuffed animals today. I'm looking forward to going back in the evening to get some night time pictures, which would be more appropriate for this blog. I got the chance to try out Screwtop Wine Bar's new outdoor seating on Fillmore Street. While only four small tables, it provides some more much needed sitting space for the unique Clarendon venue. And you won't be seeing a sign with sandwich specials on the sidewalk anytime soon after all the drama lately. I tried the red wine flight, which offered three small portions of different flavors ranging from fruity to darker and dryer. I always recommend trying the samplers at any venue that offers them (like Lyon Hall's beer flight), just because I'm usually indecisive and its an easy conversation starter. The grilled cheese sliders where delicious, although slight in portions. Screwtop is great dating venue, has a nice wine and cheese selection, some good appetizers but its not going to be cheap. There menu is a little bit confusing and needs to be streamlined a little. Overall I'm very happy with what Screwtop offers to the local nightlife and hope to go back soon, or to take some of their wine classes once they resume after August. Thanks to Jason's DC Foodies blog for the image and a very thorough review of Screwtop. 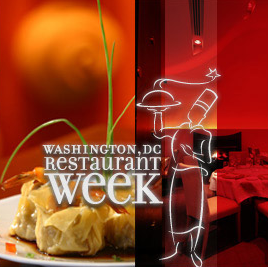 We are now in the middle of DC Restaurant Week which ends this Sunday, August 22. All participating restaurants, and there are many of them in the city, offer a $20 "three course" lunch and a $35 "three course" dinner. I use quotes here because some restaurants count your drink choice as a "course." 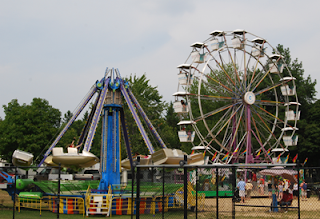 The Arlington County Fair is coming this week starting Wednesday August 18 to Sunday August 22 at the Thomas Jefferson Community Center. The fair will feature a lot of family friendly events like Bixby's Rainforest Rescue, racing piglets, carnival rides and food, games, a Kids Court, and outdoor movie nights. Follow the fair on Twitter or Facebook for the updates and chances to win prizes. 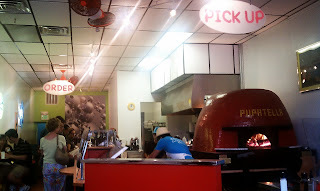 Down Wilson Blvd just past Ballston is a hidden jem of a pizza parlor named Pupatella. Sitting across from Super Pollo, this small cheap eats joint pumps out delicious brick oven Neapolitan style pizzas. As a bonus, they offer gelato for dessert. A friendly atmosphere with bright trendy decor, the place is a family run shop. Meaning just because you are ready to eat does not mean they will be open or the pizza dough will be ready. But it is well worth it when you do finally get your pizza. Don't miss Garland of Hours returning to Iota next Monday, August 9. The indie / folk / experimental band has a strangely catchy air about their earthy tunes. I especially like their song Brick Eyes. The local band is actually a collective of many artists with much cello and keyboards accenting their music. Also, fellow Arlingtonite Anna Connolly will once again be opening for the band along with Dennis Kane, a Black Cat vet. The new local blog DC Dives recently highlighted a much overlooked and hidden venue nearby: Quarterdeck in Rosslyn. The fact that this crab house is tucked away just south of Route 50 on Fort Myer and 12th street in the middle of a residential neighborhood doesn't stop it from being crowded. Every time I've passed by the large outdoor seating has been packed, mostly with people enjoying the crabs as the rest of the menu isn't consistent. 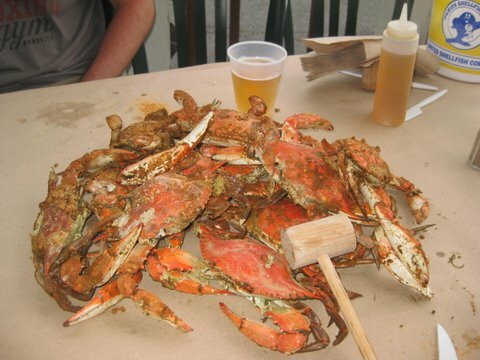 This is a great place to get crabs locally, and is better than driving all the way to the Bay for the tasty seafood. Check out more of DC Dives for other local cheap eats!